A growing body of research suggests that school climate may be an important variable in explaining why some schools are more successful than others. 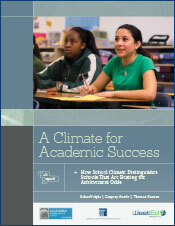 This report, written by WestEd’s Adam Voight, Gregory Austin, and Thomas Hanson, contributes to this research by exploring the climate of a handful of secondary schools with extraordinary success compared to that of other schools, including those that consistently underperform. School success is often defined in absolute terms, such as average standardized test scores. But such criteria are known to be strongly correlated with the socioeconomic characteristics of a school’s student body. And the fact that a largely affluent student body is linked to school success offers little useful direction for those trying to improve achievement in struggling schools with low-income student populations. To address this limitation, the present study’s design and methodology take student characteristics into account. Specifically, a successful school is defined as one whose test scores are better than would be predicted based on its student characteristics. Using this definition, A Climate for Academic Success investigates how two factors—school climate and school personnel resources—differed among three groups of California secondary schools. In addition to the Report Summary, a Full Report and an updated list of California Beating-The-Odds Schools are also available. 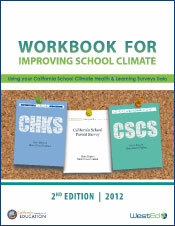 This workbook shows educators how to use findings from their school or district surveys to create supportive school climates — climates that enhance professional outcomes for staff, academic and social-emotional outcomes for students, and involvement outcomes for parents. 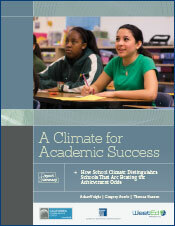 This report describes a study that examines what makes successful schools different from other schools. The study adds to the growing body of evidence suggesting that school climate is an important factor for school success. This book synthesizes ten years of research, detailing how best to incorporate resiliency research to help young people thrive in school and in their communities. School Climate Assessment and Professional DevelopmentThe Healthy Kids School Climate Survey improves student, staff, and community engagement in and out of school.